The spooks weren't even close to being certain that Osama bin Laden was holed up in the 1-acre (0.4 hectare) compound outside Abbottabad, Pakistan, on April 28. CIA Director Leon Panetta explained to President Obama that afternoon that the agency had no hard proof he was there, no pictures or voice-recognition data of his presence, nothing that could guarantee that the world's most-wanted man was sheltering inside. If you had to lay odds on bin Laden's being inside, CIA officers said soberly, it could be as low as 50-50. This was not, by any measure, a slam dunk. 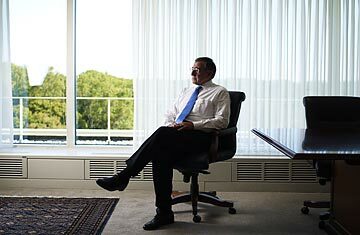 But the window for action was closing, Panetta worried. In an interview with TIME, the CIA director (and soon to be the next Secretary of Defense) explained that more than 100 people had already been briefed on the mission, a fact that by itself was making an operation riskier by the day. Panetta was also fearful that bin Laden might move again and the U.S.'s decadelong hunt to bring him to justice would start all over. Besides, Panetta explained, the CIA was confident enough that bin Laden was inside that he felt the President's national-security team was looking at "an obligation and a responsibility on all of us to act." The next day, Obama delivered written authorization for Panetta to run the operation that would kill bin Laden using a Navy Seal team. That marked quite a change. A few years ago, it would have been hard  maybe impossible  to find a politician in Washington willing to bet on a CIA weather forecast, let alone a life-and-death mission of national importance. The CIA, according to a 2005 CIA inspector general's report, had "suffered a systemic failure" in the run-up to the 9/11 attacks when it failed to work with other U.S. agencies to thwart the plot. The agency had been part of the team that lost bin Laden at Tora Bora in December 2001, the last time anyone had a clear idea of where he was. Under pressure from Bush Administration officials to justify a war with Iraq, the top spooks helped convince the world that Saddam Hussein had weapons of mass destruction when it turned out he had none. Few complained when Congress started carving the agency into pieces in late 2004. So with the spectacular coup in Abbottabad, it's fair to ask, Has the CIA turned itself around? Can the secret agency in suburban Virginia once more protect the country, while telling the truth about the threats it faces? In his first interview since running the operation that killed bin Laden, Panetta argued that his agency has earned the nation's trust again. "This place really does have a fundamental commitment to protecting the country," he said. "If you provide the right leadership and the right values, they're going to do one hell of a job." Not for the first time, the CIA has marched a long road back to self-respect. When Panetta, a former Congressman, Cabinet member and White House chief of staff, arrived at the agency in February 2009, the place resembled nothing so much as a whipped dog. It had been the favorite punching bag during the Bush years, blamed for its errors as well as the misjudgments of the political leaders to whom it answered. Panetta's predecessor, General Michael Hayden, had tried to rebuild the agency's reputation on Capitol Hill, rolling back interrogation and detention programs that had brought accusations of torture and illegal activity, focusing instead on producing reliable, actionable intelligence. But "the relationship with Congress had gone to hell," Panetta says, and the agency was gun-shy. "Every time they went up on the Hill, they got the hell kicked out of them, and they became very defensive." It helped that the CIA was much diminished. Acting on the recommendation of the 9/11 commission, Congress stripped the CIA of much of its power over sister agencies like the National Security Agency and the 11 other members of the U.S. "intelligence community" in 2004. Whereas once the CIA chief determined the budgets of the other agencies and safeguarded CIA supremacy in intelligence operations abroad and intelligence analysis at home, by 2006 it was merely one agency among many competing for the attention of policymakers. The CIA fought the restructuring and lost.